Jaguar Land Rover’s ambitious growth plans are underpinned by our ability to identify and recruit talented people to become the next generation of professional retailer employees. Our Retailer Apprenticeship Programme is the platform for developing new enthusiastic recruits to meet the needs of our customers today and tomorrow. Jaguar Land Rover seeks to ensure that our workforce properly reflects the society it serves and takes action to attract Apprentices from increasingly diverse backgrounds into the profession. In this way, Jaguar Land Rover can benefit from the diversity of thought, innovation and creativity. The best employers understand that creating a diverse and inclusive workplace can deliver business benefits, enabling us to bridge skill gaps and harness the talents of all employees. The Jaguar Land Rover Retailer Apprenticeship Recruitment and Support Team make every effort to ensure that we are attracting and identifying the best talent for each retailer that we work with. Jaguar Land Rover’s ambitious growth plans are underpinned by our ability to identify and recruit talented people to become the next generation of professional retailer employees. Our Retailer Apprenticeship Programme is the platform for developing new enthusiastic recruits to meet the needs of our customers today and tomorrow. Jaguar Land Rover and the Retailer Network are committed to providing equal opportunities in employment, taking all reasonable steps to encourage and identify the best talent and to creating an inclusive working environment where all staff are assisted and encouraged to reach full potential. The Jaguar Land Rover Retailer Apprenticeship Recruitment and Support Team make every effort to ensure that we are attracting and identifying the best talent for each retailer that we work with and are keen to hear from you if you see your short, medium or long term future in the motor industry. The industry is for everyone and we'd love to work with you. For us, it's all about working with the most ambitious, motivated and engaging people. Our female learners are an important part of the diverse mix of people that help to make the programme the great learning environment that it is today. 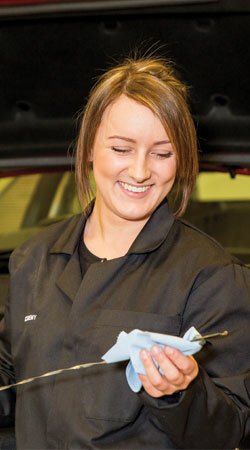 Why not have a read of what some of them had to say on our Meet our Female Apprentices page.